Ships Monday, April 29 if ordered in the next 5 hours and 27 minutes! Cell-Tech is the most powerful hardgainer creatine formula engineered for maximal gains in size and strength. Break through your plateaus fast with enhanced nutrient transport and the exact 10g dose of creatine for effective strength and musclebuilding gains. Subjects using the core ingredients in Cell-Tech gained an incredible 3.4 lbs. of muscle in just 7 days. The ultimate hardgainer creatine formula, Cell-Tech delivers 7g of HPLC-certified creatine monohydrate and 3g of creatine HCl which helps improve between-set muscle recovery, amplify muscle performance, and build more lean muscle. Get more muscle size and fullness with the multi-stage combination of carbohydrates which helps shuttle creatine into the muscle and rapidly replenishes glycogen stores and deliver an intense muscle-expanding effect. 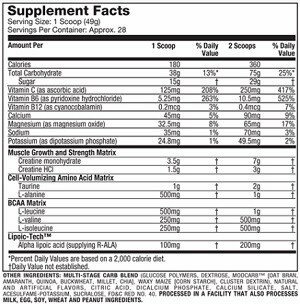 Cell-Tech supplies L-leucine, L-valine, and L-isoleucine in a 2:1:1 ratio as well as taurine and alanine. These free-form amino acids are some of the most abundant amino acids in muscle and aid in cell volumization. For enhanced nutrient transport Cell-Tech includes 20 0mg of alpha lipoic acid (ALA). Research suggests that ALA helps improve the absorption of creatine and glucose into the muscle cell through specialized transporters. Cell-Tech ingredients are supported by over 30 research studies. The 10g clinical dose of creatine was shown to provide fast muscle growth and increased strength. This includes 7g of creatine monohydrate, the most studied form of creatine in the world. Cell-Tech is the only formula with the precise 75g dose of a multi-stage carb blend. This forces a powerful insulin spike post-workout, which helps shuttle creatine and other nutrients into muscles. Subjects who consumed the amount of creatine and carbohydrates supplied during the Cell-Tech loading stage gained, on average, 3.4 pounds of muscle in 7 days. Subjects taking creatine with juice gained only 0.8 pounds. In another study, subjects taking the amount of creatine and carbohydrates found in two scoops of Cell-Tech significantly increased their strength on the bench press by 17%, leg press by 29% and biceps curl by 28% respectively. 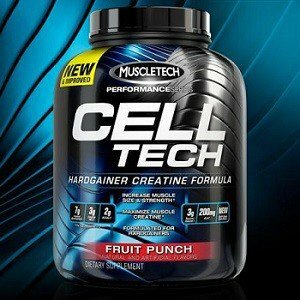 Review "Muscletech Cell Tech Performance Series Powder, Fruit Punch - 6 Pounds"
MuscleTech Cell-Tech Performance Series, Creatine - 3.09 lb.